Love breakfast so much you eat it for dinner? Well, now you can even have it for dessert too with these breakfast-themed cupcake recipes. From pancake-and-bacon cupcakes to coffee-infused cupcakes, learn how to turn your favorite morning meal into a tantalizing dessert. Combine the goodness of flapjacks with savory bacon, and you have a drool-worthy pancake-and-bacon cupcake recipe by createdby-diane.com. Go ahead and have two — we won't judge. In a bowl , combine the pancake mix with the milk until smooth. Pour the batter in equal amounts into a lined cupcake pan. Bake the cupcakes for 13 minutes, and set them aside to cool. 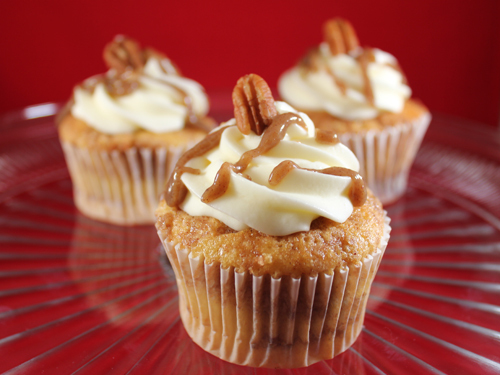 While your cupcakes are baking, beat together the butter, sugar, maple extract and milk, blending until smooth and creamy. Using a #846 tip, pipe your frosting onto your cooled breakfast cupcakes. 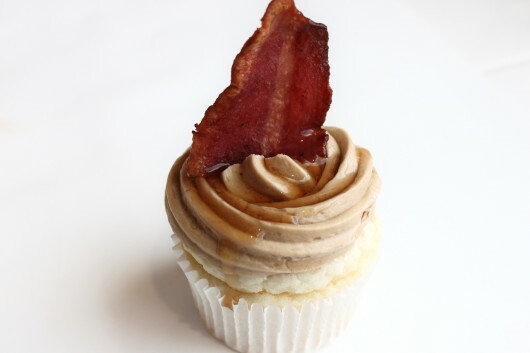 When you're ready to eat, drizzle a cupcake with pancake syrup, top with a crispy piece of turkey bacon, and sink your teeth into this bacon-topped breakfast cupcake any time of the day. 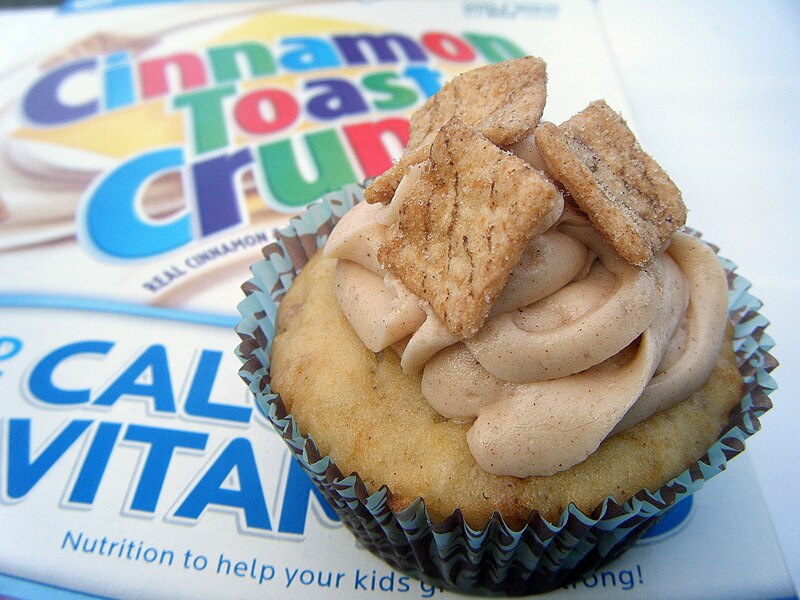 As if the cereal spin-off of your favorite breakfast item wasn't tantalizing enough, ingredientsofa20something.com went and baked up a cupcake chock-full of Cinnamon Toast cereal goodness and took it to a whole new level of yumminess. Spoons optional. Preheat your oven to 350 degrees F. Line your cupcake pan with liners. In a large mixing bowl, use an electric mixer at medium speed to beat together the butter and sugar until pale and fluffy. Then beat in the vanilla extract. Add the eggs 1 at a time, beating well and scraping down the sides of the bowl after each addition. At low speed, beat in the buttermilk until just combined (the mixture will look curdled). Add the flour mixture in 3 batches, mixing until each addition is just incorporated. Fold in the crushed cereal. Pour the batter into the lined cupcake pan (I poured 2 cookie scoops' worth, which is like half full). Bake until golden brown, which is generally a little longer than 15 minutes. Just watch it. Beat the butter until it is light and creamy. Add the powdered sugar about 1 cup at a time. After adding each cup, increase speed, and beat heavily for about 10 seconds (this makes the frosting lighter). After all the sugar has been added, add the vanilla and cinnamon, to taste. Frost the cupcakes, and then top them with cereal. Yum! With a hint of maple syrup and the crunch of a waffle, this mouthwatering breakfast cupcake from bake2thefuture.com puts dessert into a whole new dimension. Preheat your oven to 350 degrees F, and line a 24-cupcake pan with liners. Sift together the flour, baking soda, baking powder and salt, and set aside. Beat the butter with the paddle attachment of mixer until smooth. Add the sugar, and beat until fluffy. Add the whole eggs 1 at a time, followed by the 2 egg yolks. Mix in the extracts and maple syrup until combined. Alternate adding the dry ingredients and the buttermilk until just combined. Reserve some cake batter to make waffle bites. Fill the cupcake liners to half full, and bake for 20 minutes or until a toothpick inserted in the centers comes out clean. Allow the cupcakes to cool completely. Drop a teaspoon of reserved batter into a waffle iron, and cook until crispy. Let the waffle bites cool on wire racks before topping the cupcakes with them. To a saucepan, add the chopped strawberries and sugar. 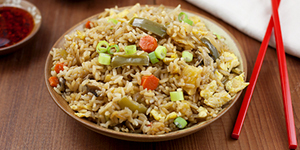 Cook over medium heat until the mixture becomes soft and all excess water has evaporated. Remove from heat, and let cool. 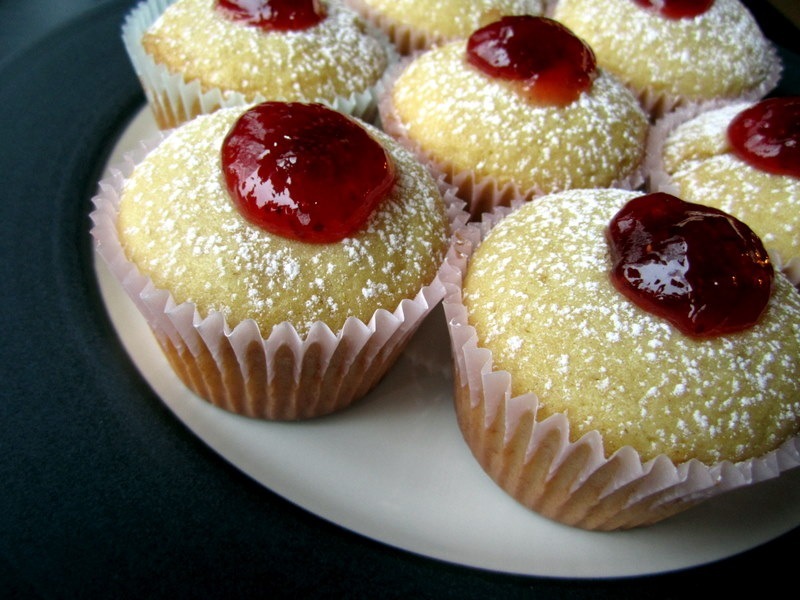 Make holes in the centers of the cupcakes, and fill with strawberry compote. Frost the cupcakes with the maple buttercream frosting. Decorate with waffle pieces and a fresh strawberry, and add a little maple syrup and confectioner's sugar on top just because! Oh. My. Deliciousness. Sweettoothsweetlife.com combined all things tasty and created a cupcake-sized jelly-filled doughnut with the potential to replace breakfast altogether. In a medium bowl, stir together the flour, baking powder, baking soda and salt. Set aside. In a large bowl, beat the butter with an electric mixer on medium to high speed for 30 seconds. Add the granulated sugar, brown sugar and vanilla, and beat until combined, occasionally scraping down the sides of the bowl. Add the eggs 1 at a time, beating well after each addition. Alternately add the flour mixture and milk to the butter mixture, beating on low speed after each addition until just combined. Spoon the batter into standard muffin cups, filling each about 2/3 full. Use the back of a spoon to smooth the batter. Bake the cupcakes for 15 to 18 minutes or until a toothpick inserted in the centers comes out clean. Let the cupcakes cool in the muffin cups on a wire rack for 5 minutes, and then remove the cupcakes from the muffin cups to cool completely. Spoon the jelly, lemon curd and/or cream filling into separate pastry bags fitted with small round tips. Insert the tip into the top of each cupcake, and squeeze the filling into the cupcakes until some is visible on the top. Sift powdered sugar over the cupcakes, and enjoy! Prepare your taste buds to be amazed by this cupcake recipe from gwenskitchencreations.blogspot.com. Chances are you won't be able to tell they aren't the breakfast favorite. Preheat your oven to 350 degrees F. Line a 24-cupcake pan with liners. Prepare the basic yellow cake batter, using the recipe above or the store-bought cake mix. Fill each cupcake liner 1/4 full with batter. In a small bowl, mix together the brown sugar and cinnamon. Sprinkle 1 teaspoon of the mixture over the unbaked cupcakes. Fill each cupcake liner with batter again until 2/3 full, no more. Sprinkle another teaspoon of the cinnamon-sugar mix. 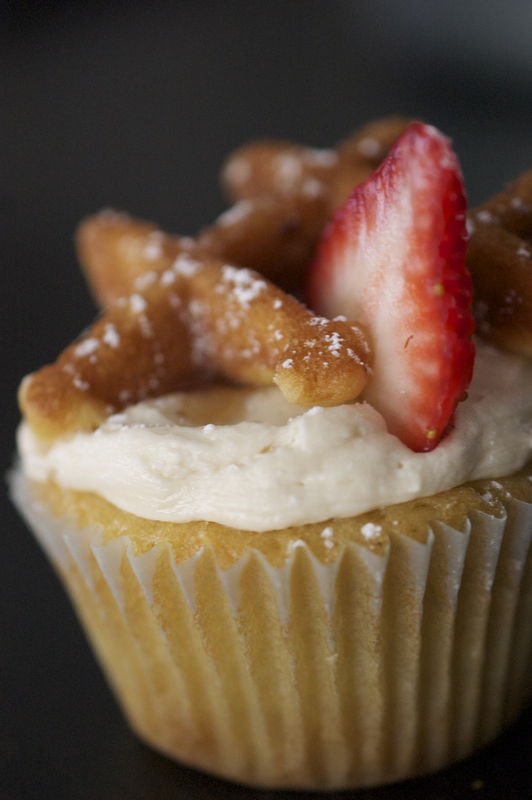 Using a toothpick, swirl the cinnamon-sugar all over the cupcake. Bake the cupcakes for 15 minutes or until a toothpick inserted in the centers comes out clean. Let the cupcakes cool on a rack. In the bowl of a mixer, use the paddle attachment to cream together the butter and the sugar until fluffy. Add the cream cheese and vanilla, and beat until combined, about 2 minutes. In a small saucepan over medium heat, melt the butter with the sugar and cinnamon until combined and pourable. Do not allow the mixture to boil. Let the glaze cool for a minute, and then drizzle it over the frosted cupcakes. 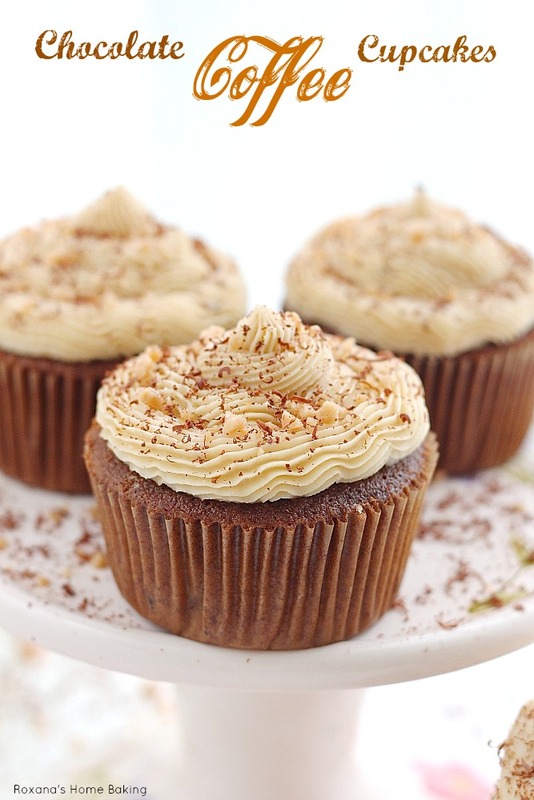 Brewed coffee paired with the sweet taste of chocolate may have you considering replacing your morning cup of joe with this cupcake recipe by roxanashomebaking.com. Preheat your oven to 350 degrees F. Line 2 cupcake pans with 18 paper liners. In a mixing bowl, cream together the butter and sugar for 2 to 3 minutes until light and fluffy. Add the eggs 1 at a time, beating well after each addition. In a separate bowl, sift together the flour, cocoa and baking powder. Add the flour mixture alternately with the cold coffee to the creamed butter. Mix until just combined. Scoop the batter into the lined cupcake pans, and bake for 20 minutes or until a toothpick inserted in the centers comes out clean. In a mixing bowl, whisk the butter for about 2 minutes until light and fluffy. Add the powdered sugar 1/2 cup at a time, whisking well. When all the sugar is incorporated, add the cold coffee and enough heavy cream to reach the desired consistency. Whisk for an additional minute. Spoon the buttercream into a piping bag, and frost the cooled cupcakes. Grate some chocolate on top, or sprinkle some crushed candy, if desired.